How can a guest get the absolute most theme park fun – and value – out of a Walt Disney World visit? The overarching tip is: Get to know the territory. Do research. Ask questions. Visit the official Walt Disney World Resort website (www.disneyworld.com) and obtain a free vacation planning DVD; at the site, also check out the online planning tools which offer suggestions about experiences which may be of interest to first-time guests or to those combining a celebration with a Disney vacation. Consult with the Disney World Moms Panel (www.disneyworldmoms.com) comprised of Disney-savvy parents who share knowledge in an online forum. The information gleaned from a combination of sources may lead a guest to conclude – correctly – that many considerations are involved in getting the most out of the theme park experience. Furthermore, many of the considerations ultimately involve a guest’s interests and individual circumstances. For instance, while the four Walt Disney World theme parks are all created for family fun, virtually any guest familiar with Disney World has a “favorite park.” That’s because the parks’ themes vary dramatically – from lands of whimsy in Magic Kingdom to worlds of scientific and cultural accomplishment at Epcot to streets, sets and backlots of show business at Disney’s Hollywood Studios, to realms of animals living, extinct and imaginary at Disney’s Animal Kingdom. With “homework” ahead of vacation, a guest can customize an itinerary to suit interests as well as considerations such as age, height restrictions and ambulatory limitations. A valuable source of information relating to “Traveling With Little Ones” and “Guests With Disabilities” is www.disneyworld.com. Many considerations that impact satisfaction are common to all guests. They involve tickets, time and convenience. Here’s a closer look at some aspects of ticket-buying, time use (plus time saving and time “expanding”) and guest services that can add up to an exceptional, value-enhanced theme park experience. ♦ Per-day ticket costs decrease for longer stays. A seven-day ticket without optional features brings down the per-day cost to less than half the price, per day, compared to seven individual one-day Base Tickets. And the per-day cost of a 10-day ticket is less than one-third the price, per day, compared to 10 individual one-day Base Tickets. 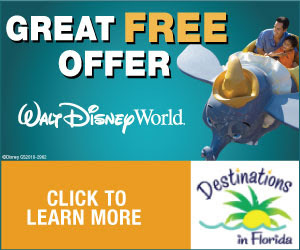 ♦ Kids under age 3 are provided free admission to all Walt Disney World theme parks. It provides admissions to the guest’s choice of Disney’s Blizzard Beach water park, Disney’s Typhoon Lagoon Water Park, DisneyQuest, Disney’s Oak Trail golf course and ESPN Wide World of Sports Complex. The number of admissions it provides varies depending upon the number of days of the Base Ticket (the option added to a one- or two-day Base Ticket provides two visits to the guest’s choice from among the listed attractions; added to a seven-day Base Ticket, it provides seven visits). It costs $57. Considering that one-day admission to a water park is $44-$52 or to DisneyQuest is $38-$44, substantial savings are possible. If the vacation stay is longer, “hopping” is perfect for repeating favorite attractions at the various parks. If the guest is staying “on property,” park-hopping can be the ticket to extra time in the parks (more about this under “Making the best use of time”). At the entrance to experiences offering FASTPASS, two times are posted – (1) approximate wait time using the normal queue and (2) return time for FASTPASS tickets currently being issued. If the wait in the normal queue is long, guests can choose to obtain a FASTPASS ticket (at no charge) with an assigned return time (an hour-long window) and then use the time until then to enjoy other experiences in the park. Upon returning to use their FASTPASS, the guest can experience the attraction with little or no waiting. ♦ A “rider swap” program lets both parents enjoy a ride – one parent waits with a child who is unable to ride an attraction while one parent rides. Afterwards, the other parent can board the ride with minimal wait time. ♦ Tip Boards located at strategic “crossroads” in each theme park provide guests with a heads-up concerning attractions’ wait times. Guests can save time – and “steps” – by consulting the boards throughout the day. ♦ Select mobile devices are capable of running downloadable apps that allow the user to obtain real-time wait information. The exclusive time is one hour prior to scheduled park opening or up to three hours after park closing. The park varies from day to day. In all, there are up to 16 extra theme park hours available each week. The time is exclusively for guests of the Walt Disney World owned-and-operated hotels plus Walt Disney World Dolphin, Walt Disney World Swan, Shades of Green, the Hilton at Downtown Disney and Residents and Guests of Golden Oak in the Walt Disney World Resort. Disney water parks sometimes open one hour early for guests of select Disney resort hotels. To take advantage of the additional time in the parks, guests must have a Magic Your Way ticket valid for the park(s) offering Extra Magic Hours – and, of course, their hotel ID. The Park Hopper option on Magic Your Way tickets allows guests to take advantage of Extra Magic Hours in a park or parks different from where the guest spends the rest of the day. ♦ Guests arriving at park opening frequently head to a favorite attraction and enjoy it before it gets busy. ♦ Guests who decide to forego viewing a popular parade frequently discover it’s a time to experience a popular attraction with less wait. ♦ Festivals and special events are times when the theme parks feature extra entertainment and excitement – included with regular admission. Several long-running events are the Epcot International Flower & Garden Festival (spring), Epcot International Food & Wine Festival (fall), Star Wars Weekends (spring at Disney’s Hollywood Studios), and elaborate decorations and seasonal entertainment at all four parks for the holidays. Avoiding the busy times likely means shorter waits for attractions and shows and better access to dining reservations. Busy times can mean extended operating hours and sometimes special incremental entertainment. Disney planners attempt to schedule periodic attraction closures for refurbishment at times other than vacation peaks. ♦ Table Service restaurant experiences can enhance the theme park experience. There are restaurants that are worth the extra planning effort of a reservation, the extra time at the table, and possible extra expense. These eateries, replete with elaborate theming, extend the entertainment experience of the park to mealtime. Dining and relaxing in an ambiance reflecting a different time or place is an entertainment experience worth the time sitting. Sometimes these restaurants serve up entertainment acts along with meals. And sometimes the meal may be part of a package that provides preferred seating at no extra cost for a signature entertainment performance (such as Candlelight Processional at Epcot or “Fantasmic!” at Disney’s Hollywood Studios). ♦ For a short-duration visit, make a short list of “must-sees” and “must-dos” based on the vacationing group’s interests. One of the worst mistakes a guest can make is over-scheduling. Be realistic in planning. Don’t attempt to see and do everything. Vacation shouldn’t feel like a track meet! And remember to take into account any relevant factors such as height restrictions or ambulatory concerns. ♦ Special guide maps pointing out kid-stuff – where you can find the characters plus attractions, entertainment and interactive activities of special interest to young children – are available at Guest Relations in all the theme parks. ♦ Baby Care Centers in all four theme parks feature private rooms with rocking chairs for nursing mothers, diaper-changing rooms, and feeding rooms with highchairs, bibs and plastic spoons. There are even diapers, formula and teethers for sale. A length-of-stay rental saves some money. ♦ Theme park guidemaps are available in six languages – English, French, German, Japanese, Spanish and Portuguese. They are available at Guest Relations locations in each park, along with times guides for shows, character greetings, parades and fireworks. ♦ The Guidemap for Guests with Disabilities provides a detailed overview of services and facilities available for guests with disabilities and is available at Guest Relations locations within all four parks as well as Lobby Concierge locations at Walt Disney World resort hotels. Types of disabilities covered include mobility disability, hearing disability, visual disability and non-apparent disability. A length-of-stay rental ticket is available which offers not only savings but also involves a one-time payment transaction after which the guest simply shows the receipt at the stroller rental location and is expedited through the queue with little or no wait time. Whether dining at a table-service restaurant or at a quick-service restaurant, desired dining requests will be addressed. In many cases, advance notice is required – usually at the time of your reservation. Please call Disney’s Dining Reservation Center at 407/WDW-DINE to discuss arrangements. Disney’s PhotoPass service photographers are stationed at prime photo spots throughout the theme parks. The guest’s Disney’s PhotoPass ID card (issued free) is used by the photo team to keep track of images. The images can be viewed online; guests can order prints, customized photo albums, T-shirts, mugs and more. Additional information is available online by visiting www.disneyphotopass.com. Package pickup is available at no charge. Merchandise is moved to package pickup, conveniently located near the front entrance of each park, for guests’ pickup when they are leaving the park. Hotel delivery is available at no charge to guests of Walt Disney World resorts. Purchases made prior to 7 p.m. will be delivered to the guest’s hotel by noon the following day. Purchases made after 7 p.m. will be at the hotel on the second day after purchase. Shipping is available for an additional charge at the time of purchase. ♦ Lockers are available for rental. They are first come, first served – and quite popular. They are located near the entrance of each park. There are a variety of sizes. If you are park-hopping, you don’t have to pay the locker fee a second time on a day (just a key deposit) provided you keep your receipt. The theme park itineraries that Disney guests create are as varied as the guests themselves – from their interests to their individual circumstances. But with planning, all of their experiences can be equally magical. Destinations in Florida links or logos!